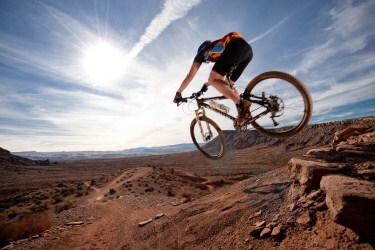 Muddy uphill trails and bumpy downhill roads are terrain for the serious mountain biker. Serious trails require a serious shoe that is built to take a beating. Mountain bike footwear should also have great traction and fit, for unsurpassed pedaling performance. Check out our picks for the best mountain bike shoes to discover the perfect fit for you; the true cyclist. These incredibly warm shoes are built for the serious biker who doesn’t even let the cold temperatures of winter keep them off the trails. A flexible but grippy Vibram outsole give you the traction to push through winter terrain, while PrimaLoft insulation keeps your toes toasty warm. Some other great features include a waterproof inner lining and optional cleat cover for gripping flat pedals. Wide feet demand a flexible shoe and forgiving fit that don’t make you sacrifice comfort or performance. This shoe offers just that. No-tie laces and a lace keeper strap provide a comfortable fit for any feet. This is paired with a mesh upper that stretches to fit your feet. These MTB shoes for men also have an anti-microbial treatment that keeps your feet fresh even on long trails. Bikers do not always want to cycle up a tough hill or over rocky terrain. In these instances, you want a shoe that grips the pedal well but that is also comfortable for walking. This shoe is breathable, on and off your bike. The other benefit of this shoe is its unique Push/Pull Lacing system that makes putting your shoes on and taking them off a breeze. 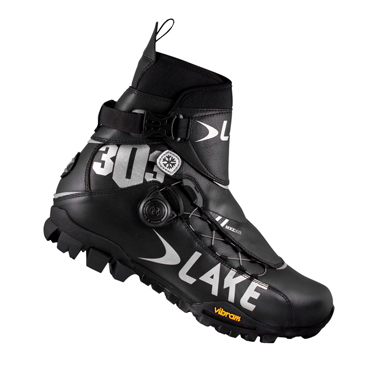 These cycling shoes for winter are everything you need for the wet, chilly trails of the freezing months. A water-repellent cuff and leather upper keep snow, ice, and frigid wind out. Inside the shoe, a Thermosol insole separates you from the chill of your bike pedal. Finally, a storm flap can quickly be fastened over your shoe for especially bad winter weather. Breathability and comfort come together in this awesome mountain biking shoe. Three Velcro closures make them easy to put on. They also provide adjustability for a customized and secure fit. 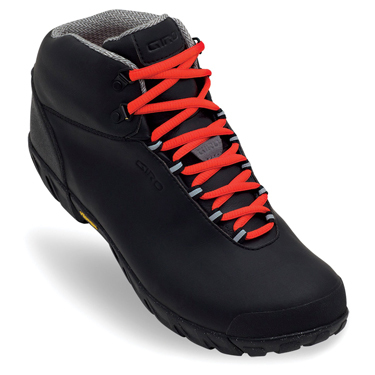 The breathable leather uppers are abrasion resistant, which makes them the perfect companion for rough terrain. A fiberglass-injected nylon sole makes this shoe stable enough to provide a sturdy pedaling platform. All the features of a great shoe come together in this mountain biking footwear. 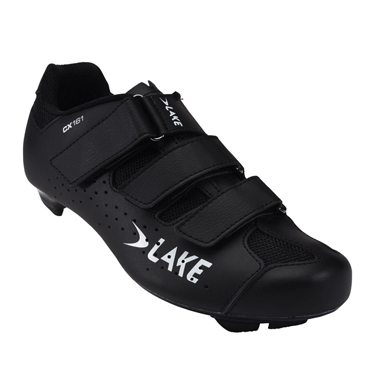 These shoes are a good option if you may come across wet or muddy terrain on your ride, since an Action Leather upper keeps water out, while bending to fit your cycling needs. Fiberglass-injections gives the shoe rigidity to provide power behind your pedaling, without sacrificing comfort. Three Velcro straps make these shoes easy to put on. Cross country cycling requires a shoe that is ready for the long haul. These awesome shoes feature an anti-microbial lining to keep the smell of sweaty feet away. They also have great traction, a breathable but abrasion-resistant upper, and rubber toe caps that protect your shoes from scuffs and scrapes. Finally, a Precision Fit design ensures this shoe hugs your foot for long-term comfort. 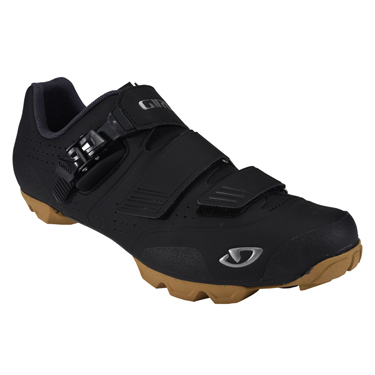 These shoes are ideal for the mountain biker hitting the trails in warmer weather. 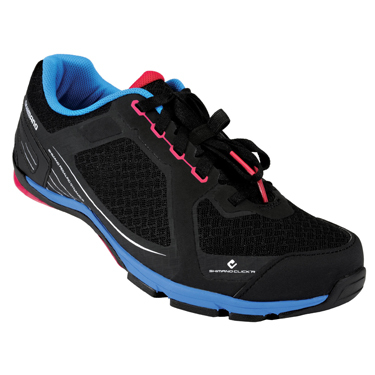 This women’s mountain biking shoe has a black mesh upper that keeps your feet cool with bright pink and blue accents so your shoes standout. 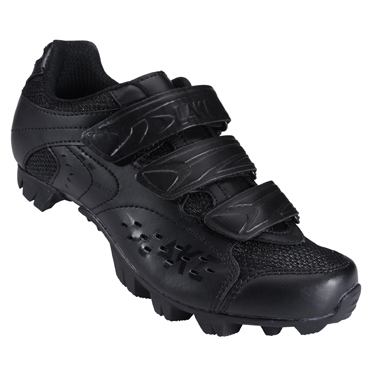 An EVA midsole and unique, ladder-shaped shank plate make these shoes powerful and comfortable for riding or walking. 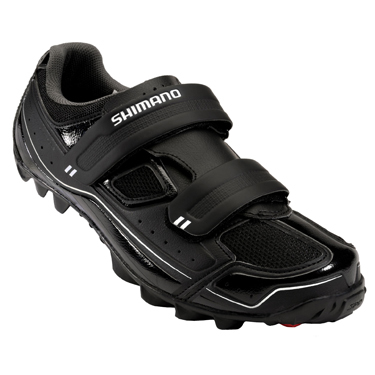 Superb pedaling efficiency and walking comfort come together in this shoe. 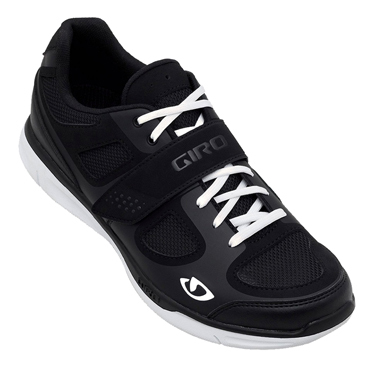 A synthetic blend of mesh and leather makes this fantastic shoe breathable, but durable. 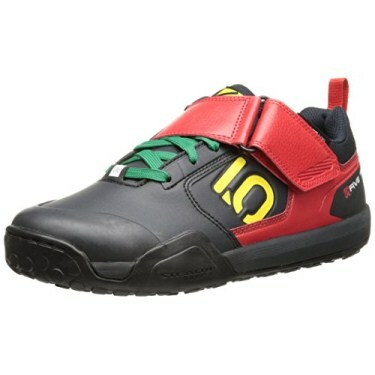 It also features a flexible insole, wide toe box, and can be adjusted from 2 easy-to-fasten straps to maximize comfort. This is paired with a polyamide midsole reinforced with fiberglass to provide the power you need to make it up the big hills. If you do not want clips on your shoes, these are the best option for you. Velcro straps and a bio-mechanical design make this shoe conform to any foot, aided by the lightweight design to leave you in control. Additionally, an upper of synthetic leather keeps water out and lets air in. This means your feet stay cool and dry on long treks.